The next step for computing giant Hewlett-Packard's restructuring is a split into two companies. HP (HPQ) announced Monday that it plans to put its PC and printer operations under one roof under the name HP Inc., and its business that provides software and services to corporate customers under another under the name HP Enterprise. The company said the split will give both companies the focus, financial resources and flexibility to adapt more quickly to the market, while also raising the stock value for shareholders. "Being nimble is the only path to winning," CEO Meg Whitman said on a conference call with investors Monday. Shares of HP jumped more than 4% in early trading following the announcement. The split is expected to be completed by the end of 2015. News of the split was first reported Sunday by The Wall Street Journal. The split follows a number of spinoffs and breakups this year. Most recently, eBay (EBAY) announced last week it would spin off the online payment platform PayPal, which it bought in 2002. Whitman took the helm in 2011 and unveiled a five-year restructuring plan. That included a major overhaul of the printer and PC business in 2012. Layoffs have totaled at least 45,000, and the company's projected savings have reached $4.5 billion per year. Whitman said that the financial success of recent years is what makes a split into two companies possible. "Three years ago this company was in a difficult situation and we needed to rebuild and do so as one HP," she said. "Today was made possible by our turnaround." Whitman's predecessor, Leo Apotheker, considered a corporate split similar to the one announced Monday, but he left the company after only 11 months. Whitman will have leadership roles at both companies, serving as CEO of HP enterprise business and chairman of HP Inc.. Dion Weisler, the current executive vice president of HP's printing and personal systems business, will become CEO of HP Inc. The two companies will be roughly equal in size. Each will have revenue of just over $57 billion and profits of more than $5 billion. 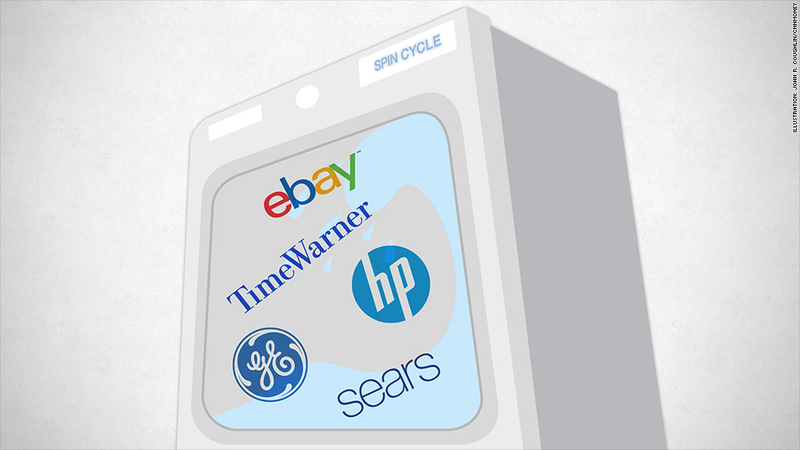 But the split might not be the only move the company makes in the next 12 months. Chief Financial Officer Cathie Lesjak told investors Monday "We will be actively looking at [mergers and acquisitions] throughout the year." Some investors applauded the potential move. The split would allow HP to be more "nimble" and let it "reshape" its business, said Brendan Connaughton, chief investment officer at ClearPath Capital Partners. In particular, Connaughton said, the move would put renewed focus on enterprise services, "where they have incredible margins," sometimes upward of 20%. HP shares struggled for several years amid turmoil at the top of the company. Whitman, the former boss at eBay, was named CEO in 2011, making her the fourth leader in just seven years. But she has helped to turn around its fortunes, as shares have tripled in value since hitting a low point in late 2012. HP is among the top five performers in CNNMoney's Tech 30 index, which tracks significant tech companies. Its stock has climbed nearly 26% this year alone, bolstered by earnings that have climbed even as sales slumped.